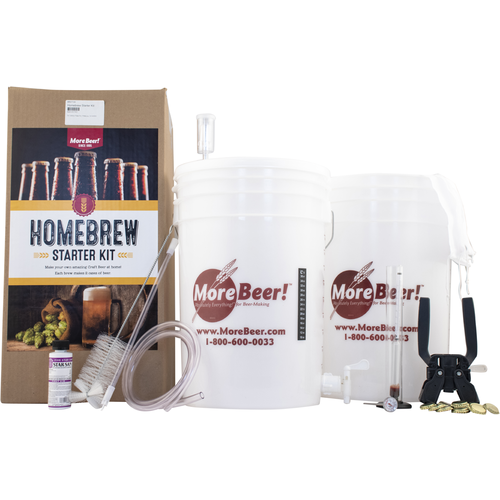 Our Homebrewing Starter Kit gets you started in homebrewing at a very affordable price. It is also the simplest system to use. 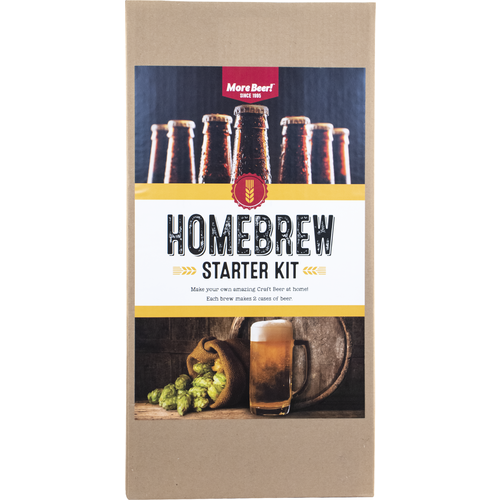 Anyone can follow the step-by-step directions and produce truly great beer with the first batch! 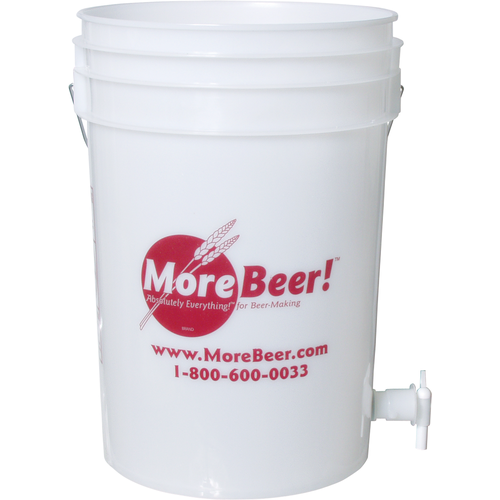 This upgradeable system is designed around two, food-grade plastic buckets which feature our handy Sediment Block Spigots for quick and easy liquid transfers. After performing the Brew Day boil process, the first bucket is used to ferment the beer for two weeks. It's then transfered into the second bucket at bottling time, and out of that bucket into your bottles. Stainless Steel Brewing Kettle - 5 gal. Frinds need to brew their own porter so it doesnt cut into my brew schedule! It seems basic enough and I think will be perfect as a Father's Day present. My dad has never brewed before so this is will interesting! What size is the transfer tubing included with this kit? BEST ANSWER: I believe it is 3/8 inch. Fits the kit anyway and can be replaced or you can get longer either at MoreBeer or your local hardware store. Spigot leaked twice. First time I thought was my fault for not tightening enough. Second time I tightened the spigot as much as I could without stripping the threads. Pics attached of leak. The other major issue is that the second bucket is unusable. The hole was drilled so low that the spigot can't be tightened. I can't even fit the o-ring over the threaded end inside the barrel. Pic also attached. I consulted with a friend of mine who runs a brewery to make sure I wasn't messing something up here, and he assured me that I did everything I could to make this kit work. Hello Gerrit - We are terribly sorry you have received your kit in such a manner. You are absolutely correct in saying the hole was drilled inaccurately. Please give us a call at 1-800-600-0033 or email us at info@moreflavor.com so that we can assist you and make right on this. We are here to help. Cheers! Love the kit! The bottle capper could DEFINITELY be better though. We broke several bottles out of a small batch with it. Overall I am happy with it though. Works well. Good starter kit at reasonable price. Good purchase for novice brewer.